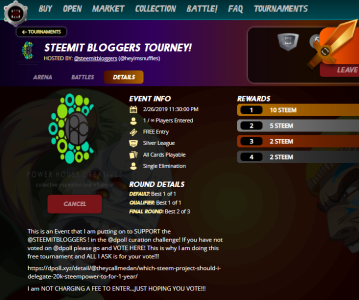 I decided to make my own tournament in support of @jaynie and the @STEEMITBLOGGERS in the @dpoll contest! JOIN HERE FOR FREE AND PLAY! JUST VOTE FOR US! WIN 10 STEEM!! Here is the link to the SteemMonsters Tournament Page! ⚡$$$ Tipped @heyimsnuffles ⚡100.00000000 SWIFT! If you don't know how I work, reply help! Currently the price of SwiftCash in the market is $0.0024 USD per SWIFT. Current value of the tip is $0.2400 USD. To find out more about SwiftCash, please read our whitepaper! Nice to see that you put up a Tournament with free entree. Guess who just became my favorite monster!!! I stay away from games in case I become addicted. Lol. Resteemed! Excellent idea - and seems like a ton of fun - but you all will be up MUCH later than this old boy! ha ha ha HAVE FUN! First time trying a tournament, thanks for the experience. I got destroyed in round 1 by a person with a legendary summoner. Good luck and have fun, people! You just got a 9.92% upvote from SteemPlus! I really wish I had more time. I have been wanting to play for sometime now. Work has been eating me up lately and I go straight to bed the moment I come home. I played Magic the Gathering back in my college days and I was told Steem monsters is something like it.